With the cost of living climbing radically and many incomes failing to rise with it, something has got to give for a lot of people. People are fast getting over-stretching their budgets, their work lives and their time and energy to keep up with pressures from society. Let’s face it, “keeping up with the Joneses’” is fast becoming an outdated concept. 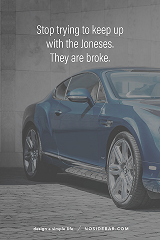 Who are these “Jones’es” people that we think so highly of anyway? Deep down many people have a sense that something isn’t working and that the system is broken. Time and energy poor people are realizing that their value is not defined by the possessions they own. Having more does not mean a higher quality of life if we don’t have time to enjoy it, or to spend time with the people we love. So how do we break the cycle? Let’s get real. Although we are all driven by different measures of these core needs (some are more driven by significance and others may be more driven by growth), it’s worth noting that not once does it mention owning or purchasing “stuff”. Often we think we need the next amazing purchase to be happy, but what we really find when we take a closer look is that we are trying to fulfill one of our six core human needs. Buying something to impress peers could better be fulfilled by being accepted by those same peers on personal rather than a material level. Some people are going tiny because they want more financial freedom (certainty). There are those who are itching for more adventures (uncertainty) and would like the convenience of taking their home with them and do not want to be tied down (variety). Some are simply craving a small retreat to escape into the forest with a loved one on a weekend (love and connection). Maybe they want more time to explore their passions (significance) or to downsize to continue their education (growth). One thing is for sure. Although the original motives vary greatly and the meaning of those motives vary greatly as well, there are many benefits to simplifying life and going tiny. When planning to go tiny, it pays to deeply analyse the things you think you want. The tiny house movement is about getting real and back to basics. We are more than what we own and a true sense of identity comes from who we are, not our belongings. Real security comes from trust in ourselves to be able to handle life’s challenges: a quality from within ourselves and unaffected by what we own. Buying and owning things can help to temporarily fill a void, but sometimes, that which we own can end up owning us through the hours of our lives we spend working for it. The smaller our home, the less we need to maintain it financially or physically, saving us time, money, and energy. In turn, this leads to more time to do what we really enjoy and fulfill our core needs in more enjoyable ways (such as putting thoughts on paper like this)! There is nothing wrong with wanting more. If that’s how you fulfill your needs and it truly makes you happy, go for it! Still, it’s certainly worth thinking about how we fulfill our needs, as it has a direct impact on our sense of happiness and success. People, both young and old, are starting to see the value in minimizing their lives to maximize their experiences and claiming back their freedom. For many, living tiny leads to a higher quality, both in their tiny homes and in their lives, than what would have been achievable had they opted for a standard sized build. Plan well and take the time to consider what you really want in your tiny house on a long-term scale, as living (or thriving) in the house after the build is even more important than creating it. Not exactly sure which of your 6 human needs you need to focus on? Click here for a simple exercise that will give you more clarity on which of the 6 core human needs are currently driving you.